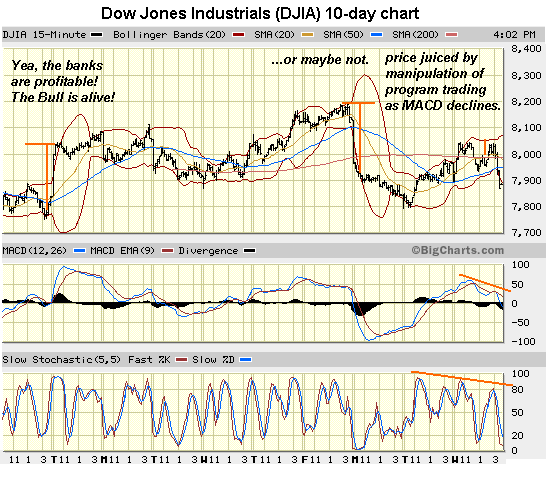 The stock market looks poised to turn down, perhaps in a major way. The chart of the past two days suggests manipulation of program buying has juiced bogus "rallies" so insiders can sell to suckers and then go short for the big plummet. The stock market looks ready to roll over. Consider three charts: Apple, Goldman Sachs and the last 10 days of the Dow Jones Industrial Average: I selected Apple and Goldman Sachs partly because they are considered "leaders" and also because they are in completely different industries. Nonetheless their charts look eerily similar in being very toppy. As always, please read the HUGE GIANT BIG FAT DISCLAIMER below before continuing which says this is my amateur opinion you're reading for free, it is not investment advice. Disclosure: yes, I am short this market, in a number of ways. In both cases the stocks are extremely overbought, the MACD is starting to roll over indicating a downtrend is approaching and price is banging on the overhead resistance of the 50-day moving average. 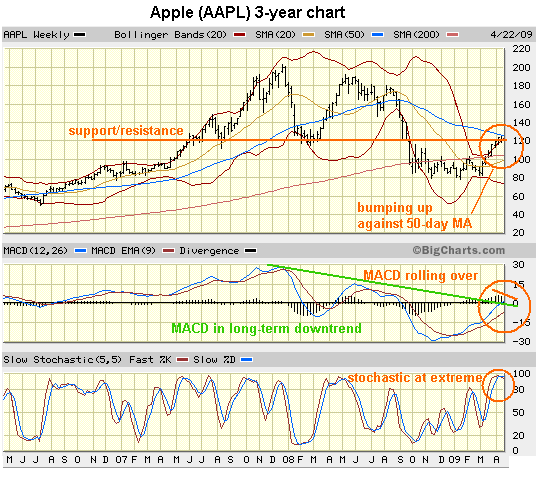 As icing on the cake, their long-term MACD has been declining for years. 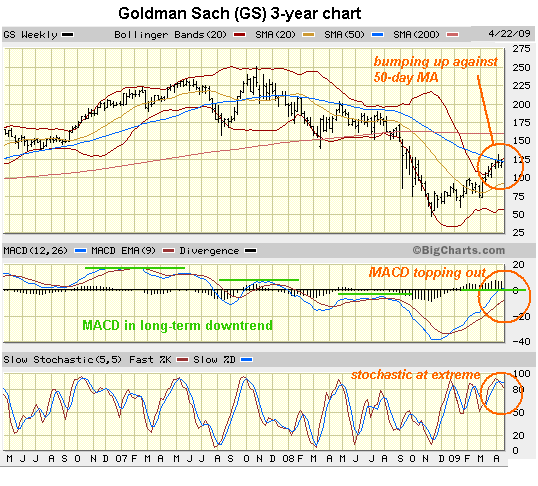 Given that the indicators are rolling over, the Bull case for additional gains is weak. If we examine the DJIA over the past 10 days, we see a chart dominated by wild swings-- just the sort of volatility which often marks market tops. Yet the VIX, one measure of volatility, is a modest 38, well below its panic tops above 80. Complacency reigns supreme even as the indicators are rolling over--not a good combination for the Bulls. Legendary stock trader Jesse Livermore explained decades ago in Reminiscences of a Stock Operator how to manipulate a market higher: start some heavy buying above the bid, which then attracts more buyers (in today's market, that attracts program buying), juicing a faux rally which the manipulator then sells into. Once he's done selling into the manipulated strength, he goes short the market, enriching himself as the market responds to gravity, i.e. there are no manipulators juicing it aloft. The past few days show the unmistakable spoor of such manipulation to create bogus rallies: sudden big leaps up with no news or other visible stimulus. This is the "bid up" buying which sparks the trading programs to jump in. Then as buying increases, the manipulators sell. Rinse and repeat until they've unloaded their long positions, then they start selling short. Once their short position is large enough--and of course they eliminated the competing shorts by their sudden "rallies" which triggered all the other shorts' stops--then they stop their buying and the market falls under its own weight, picking up momentum as traders (and black box programs) grasp that buying has dried up. If you don't believe this is possible, please read the book and brush up on how black box program trading works: seek a trend and pile on. No real Bull market starts with a sharp V recovery. Any rally worth its salt begins from a double bottom. This is a psychological truism--investors don't trust a rally is real until it re-tests its low and holds. That suggests the markets will at a minimum return to their March 6 lows. If those fail to hold, then a new low wil be reached. Can't happen? Maybe not--but these are not strong charts. These are charts just waiting for the last manipulated buying to cease so they can roll over and plummet, reaping those who built short positions major fortunes. If there are any investment banking profits next quarter, they'll be reaped selling the rally to suckers and shorting the living heck out of it just before it drops 25%. Thank you, Anthony M. ($25), for your most generous contribution to this site. I am greatly honored by your support and readership.